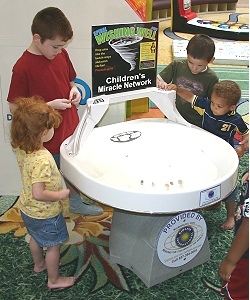 The program utilizes Spiral Wishing Wells to fill a huge local need that will simultaneously place your products and opportunity in otherwise unattainable venues. If you haven't already reviewed our website and seen the video clips, the following four links will give you a quick overview of the power of the Wishing Wells and how they have raised over $1 billion for charities around the world. We recommend that you bookmark this page so it is easy to find for later reference. 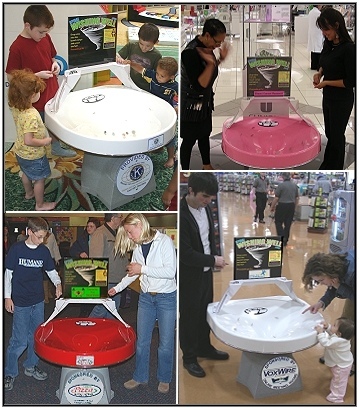 Spiral Wishing Wells are typically purchased by non-profit organizations that have their own floor space (museums, zoos, libraries, etc. ), or by stores that raise money for their corporate charity (Wal-Mart, McDonald's, etc.). In both cases, they have their own floor space where people pass by. Another fast-growing segment of users are those who only need a Well for a day or weekend for a fund-raising event. They include churches and schools, service clubs such as Kiwanis, Rotary, and Lions, and many well-known charities such as Red Cross, Habitat for Humanity, March of Dimes, Diabetes Association, Boys and Girls Clubs, Humane Societies, and many more. "The count is in, and we brought in $7,352.39 in one day! Isn't that fantastic! Of course, many people put in wads of bills and some pretty large checks. Thank you for letting us use a Well for our event." Additionally, we receive many inquiries from large stores such as Wal-Marts, Cosco's, Sears, Target, and from all the fast-food and family restaurants who are conducting an event and need a Well. This need, combined with the struggling economy which has hit all charities very hard, has given rise to a flood of requests coming in to us asking if we rent or loan Wells for short term events. We can do that locally, but it is impractical across the country from a shipping and logistic point of view. We propose that distributors purchase the Wells as a "sales aid" and loan them to all these local charities for their events with the company brand and distributor's phone number on the, "Provided by" sign and rim-sticker as shown in this picture (click to enlarge). The charity keeps 100% of the revenue they generate at no cost because the Well is loaned at no charge. 1) The "Provided by" sign produces great exposure and introduction of the company. 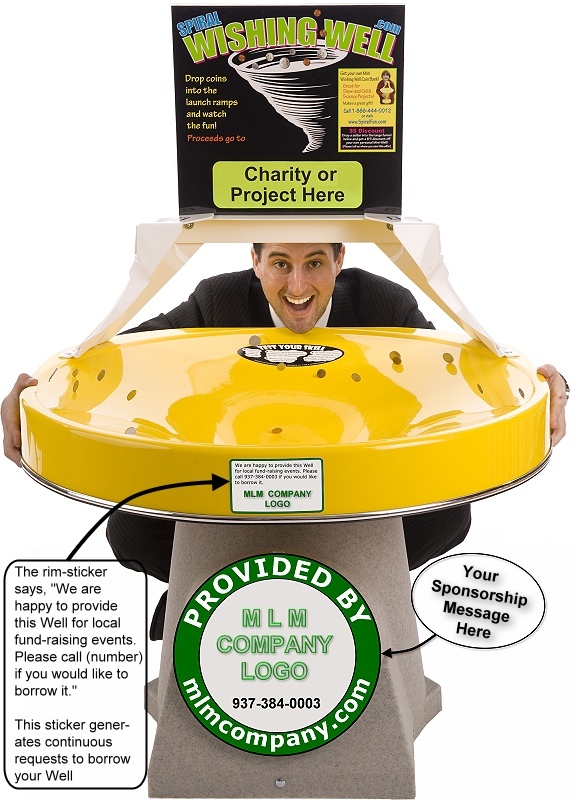 The "rim sticker" that offers the Well to others to borrow for their fund raising events generates direct calls. Therefore, every time the Well is loaned out, it is generating more requests to use it for future events. 2) The borrowing organization will pass out brochures provided by the distributor to every attendee. Some of these events include thousands of people, so the lead-potential can be extraordinary. 3) Many events include media coverage, which will leverage the exposure even more. 4) Each time a Well is loaned out, it is a "press release opportunity". 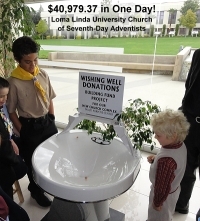 For instance, "MLM Sample Company Is Providing a Spiral Wishing Well to ABC Charity". Then, another press release can be issued after the event that describes the income. Thirdly, total revenue raised over the course of the year is another topic for a press releases in a local area. Since Wells can generate several thousand dollars per event, this number can be quite high. In fact, all the totals from all the Wells from all the Distributors in the world can be the subject of company press releases which could easily total in the millions. "We raised $248,000 in our 'Help Adam' campaign. In addition to lots of coins, people put checks and bills into the Wells too! This paid for the life-saving bone marrow transplant for Adam, and we had some money left over that matched up with other grants for other surgeries. The local media picked up the story and promoted it heavily, so it generated a lot of publicity. The Wishing Wells were the focal point of the campaign." IMPORTANT: We NEVER receive any ongoing split of the proceeds. 100% of the revenue always goes to the listed charity. Our only role is to supply the Well and to offer ongoing support and the best strategies to maximize the income for the listed charities, and to help the sponsors generate the best public relations possible. The main sign above the Well is what we call a "generic proceeds go to" sign. The borrowing charity can easily insert their logo or something printed from a computer inside the clear plastic sign frame. Based on a simple order form, we can produce the round "Provided by" or "Sponsored by" signs and rim stickers, attach them to the Well, and drop ship the Wells directly to the distributors. Or, these signs can be produced locally as they are a simple common digital sign on a vinyl over a 12" diameter piece of plastic. They are simply attached to the base with two bolts. We will refer all rental or borrowing inquiries to local distributors. Since we can't handle this kind of program from here, it will be our privilege to refer these event inquiries. c) A standard loan agreement the distributor can send to anyone inquiring about borrowing a Well. This template includes suggestions for how the borrowing charity can increase the income with a little planning and a simple agreement stating that they will pick up the Well and bring it back in the same condition. Of course, if the distributor chooses, he or she can approach a store, restaurant, theater, bowling center, shopping mall, or other retail location and offer to place the Well when it is not being loaned out. But with the number of churches, schools (bands, athletic events, boosters, etc. ), and other charities in a given city, it will be loaned out most of the time. "The Well brought in $1200 at the Mall over the weekend. Many people stopped by and it gave us an opportunity to share our story. Thanks for loaning us a Well." Churches are one of our largest customer types. They are continuously raising money for building projects, youth programs, or missions. And there are MANY churches in all towns and cities. As an example, in Dayton Ohio, there are 14 pages of churches in the Yellow Pages. All network marketing companies know that churches are a great demographic for prospective distributors, but they have been off-limits for recruiting. We can get you in! "We brought in 40,979.37 in one day at our church! Thank you so much for providing the Well to us for our fund raising event. Everyone loved it, and it was our pleasure to promote your part in providing the Well. There is no other way to advertise INSIDE a church. 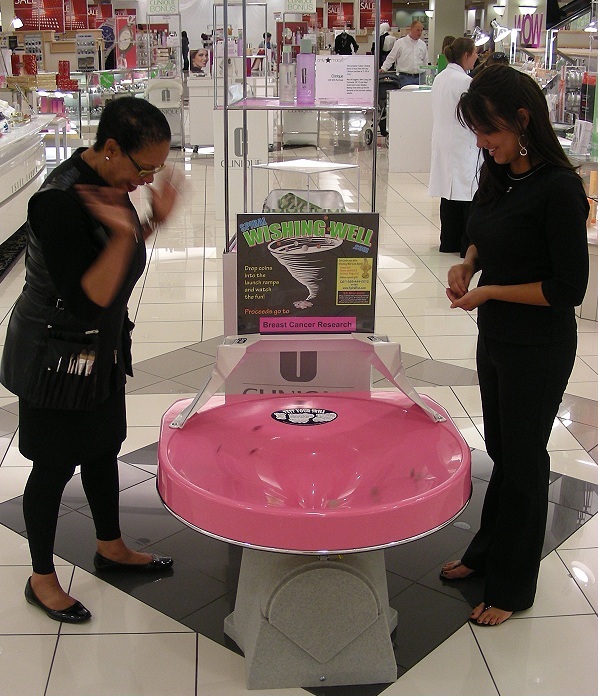 Spiral Wishing Wells are the "Trojan Horse of Advertising". Your distributor's Wells can be in different churches every week with your name and message front-and-center. Schools are another great venue. And their budgets are as crunched as any non-profit organization. They need money for sports programs, band, and all the many clubs. There are a lot more schools in all communities than people think. They include non-profit child care schools, private 12-grade schools, public high schools, and colleges. Look up "Schools" in your Yellow Pages and you will be surprised. Another great place to find charities in the Yellow Pages is in the "Charitable Organizations" and "Social Service Organizations" sections. This is where you will find all the traditional well-known charities, and many that you may never have heard of. There are civic organizations such as Parks and Recreation, Chambers of Commerce, and various community events. Check your local paper, especially the section that lists weekend events. All you have to do is call and offer your Well, or send them our suggested email or letter template. These are just a few of the examples that will make it easy for your distributors to have their Wells in front of new prospects every weekend and many week nights. Our press release and template tools make it the easiest kind of prospecting that your distributors will ever do. We recommend a limit of 1 Well to a population of about 10,000 which has enough churches, school events, and other charities to make regular use of the Well throughout the year. 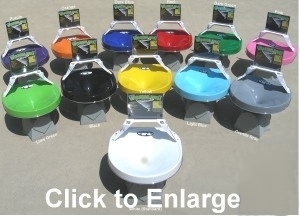 The normal cost of a Three-Footer model (diameter), which is the most popular size for this type of use, is $1,995.00 (plus $100 for colors). For this MLM-Network program, if the distributor agrees to loan it to charities who get 100% of the revenue, Project Kindness will provide an assistance grant of $500 per Well, and the distributor is responsible for the balance and shipping. If a company or distributorship line promotes this program and generates a significant quantity of Wells, the grant amount can be increased. Please inquire about this option. Each Well includes everything you need to put it into immediate service, including a padlock and 2 keys and the generic "Proceeds go to" sign and clear plastic frame above the Well. All the charity has to do is slip in their logo or something from their computer designating the recipient. The only thing not included that is discussed above is the "Provided by" sign and rim sticker which is $45 per Well, or you can have them made by a local sign maker. It is a simple 12" diameter sign and a peel-and-stick rim sticker. Since this is a unique program, our normal order forms cannot be used. We will customize order forms for regional or national programs. 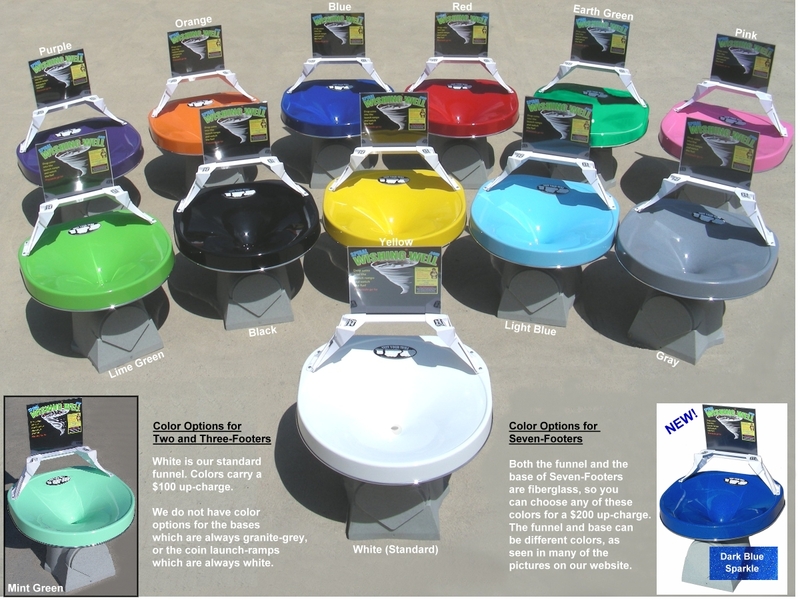 If you are an independent distributor and just want to order a Well for your own application, please contact us when you are ready to place an order. This is a very unique opportunity for network companies. Prospecting and recruiting is always challenging after the initial friends, family, and work associates are contacted. This program will generate ONGOING leads and amazing public relations. It is a great way to 'brand" the company in your area, and to develop the reputation of being actively involved in supporting local non-profit work. 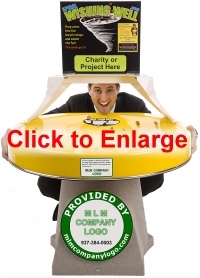 With your company brand out there in front of so many people, even direct recruiting will be easier because your distributors can mention, "We are the people that help local charities raise money with the Spiral Wishing Wells..." That makes a great segue into a presentation and invitation. If you have any questions, please feel free to give me a call or send an email.